BEST Products Store Architecture: Seeing Is Believing! Seeing is truly believing, but you won’t believe your eyes when you see the amazing architecture design of Best Products Catalog stores. BEST Products: History Lesson Time! 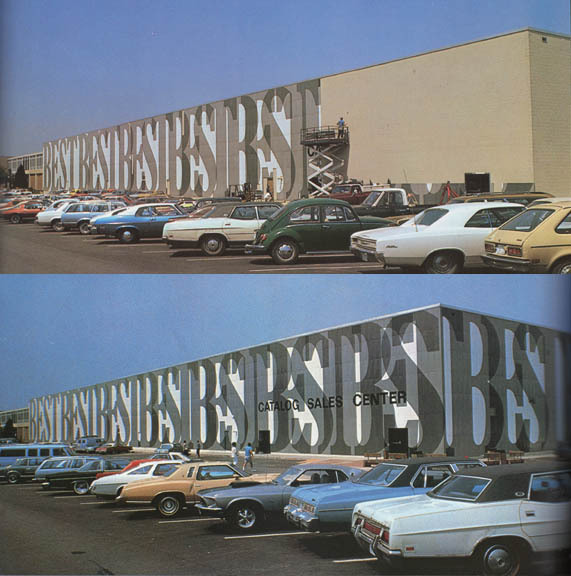 BEST Products (it is important to capitalize “Best”) was a catalog showroom retail chain, founded in 1957 by Sydney and Frances Lewis. Headquartered in Richmond, Virginia, BEST was in business until 1997. Sydney Lewis worked with his father, managing an encyclopedia sales operation, and came up with idea of selling additional merchandise along with the encyclopedia bills. The first catalog went out in 1957, with the first showroom opening at 4909 West Marshall Street in Richmond. The store employed a catalog showroom model. I shopped at a location near my grandparents’ homes as a kid, and the concept was like nothing I’d ever seen (and haven’t seen since). I recall finding merchandise on the showroom floor, taking a slip to a counter, and the product coming on a conveyor belt from the ceiling. To a kid, this seems like magic. I loved this store the way most kids love Toys R Us. Don’t get me wrong, I love Toys R Us, but seriously, the magic conveyor belt from the ceiling was truly an structure of amazement. Like I said, there’s nothing quite like it, and hasn’t been since. BEST Products filed for bankruptcy twice – once in January 1991 (re-emerged June 16, 1994) and again in September 24, 1996. The second time was the last, with the entire chain (169 stores, 11 jewelry stores, and a nationwide catalog) closing by February 9, 1997. Many of these stores are now Best Buy locations, and there is nothing of this sort in existence. 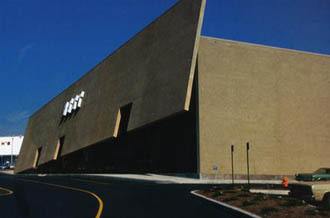 In the 1970s, BEST Products contracted with James Wines’ “Sculpture in the Environment” (SITE). The purpose was to design nine highly unorthodox storefront facilities; among them, stores in Houston, Richmond, Sacramento, Towson, Maryland, and Hialeah, Florida. To describe is to not give it justice, but to show you…oh, I can do that! In 1979, a documentary was produced to show the concept, construction, and public reaction to these stores. The facades are incredible. I’d say they were ahead of their time, but they’re not ahead of any time. They’re truly…different. Well, newly informed friends, allow me to show you the way! But first, find your way behind this tilting wall! Witness The Amazing Structures of BEST Products Stores! Retroist friends, for your viewing pleasure, the amazing design and reaction to the incredible construction of several BEST Products stores! That rainforest concept is incredible, and definitely my favorite! I’ve looked up BEST Products in the past, and usually have only come across photos. I’ve really been after commercials and videos, so to find this documentary gave me a bit of optimism to find other bits of information about the stores. As I was finishing up this post, I came across a college video about the layout of the stores. That, my friends, will be a story for another time. Why not close with another interesting concept? Makes me dizzy just looking at it! Highly-detailed photos of the structures SITE created for BEST Products! Be The Difference…In A Grocery Store Training Video! If you grew up in Chicago in the 80s, this was a very familiar TV jingle…McDade’s! You are missing the one from Houston Texas. I lived down the road from it. Unfortunately as is the case these days the building facade is no more. Now it is just another warehouse, I believe it is a food distributor. Lucky you, Scott!!! My apologies for omitting it, I don’t think I spotted the picture, or I possibly overlooked it. The one I frequented is a Best Buy. It was not one of those awesome designer BEST stores, those are amazing! Awesome read. Loved Best! 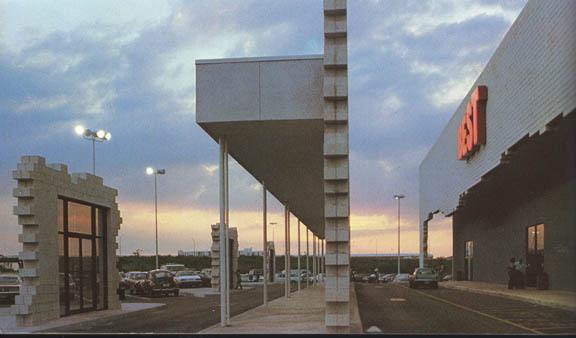 Tho ours in Texas was a normal facade, the shopping concept was cool…conveyor belt and all. Too bad that Best doc is now taken down. I wonder if it’s reuploaded elsewhere? Not sure how to search for it? Best! Previous post Are We Getting A Last Starfighter Sequel?